I was at the gym the other day, speaking with a brand new 12wbt’er about my success on the program and how much I love it. Then she asked the question everyone asks. How much have you lost? And this is where my funny little brain makes it tricky. I’m EXCEPTIONALLY proud of my efforts on the program. I’ve lost about 33kg. But the problem is that I’m still so mortified about my starting point that I don’t say that out loud. Because I was fat. Really fat. And I don’t think I ever dealt with the shame I felt about that. So I let this fear of someone figuring out my start weight from my awesome weightloss stop me celebrating. I don’t have a ticker on the forums, I don’t wear my weight loss numbers with any pride. I weighed 112 kgs (247lbs) at my heaviest. And no, I don’t mean while pregnant. 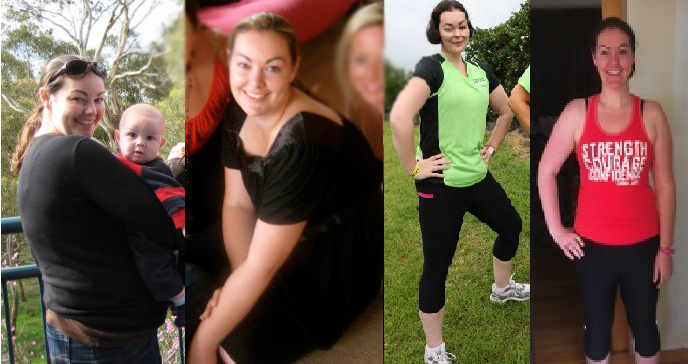 I saw that and cried, and cried, then took some radically stupid diet pills before crashing at 107kgs and finding the 12wbt. I’ve lost over 32kg. I’m getting pretty close to my goal. And I’m brave enough now to own up to where I’ve been, so that I can be clear on where I’m going. ← I want to win the 12WBT…. Well done! I totally understand the reluctance to share but now you can use your old stats to encourage others. Good on you for achieving all you have so far. Well done you for owning it! You have done such a great job and you should be nothing but proud of how far you have come! Good on you for owning your amazing success so far! You should not be ashamed, you should feel nothing but pride in how far you have come and how inspirational you are to others! Well done you! Your weight loss is inspiring, and I have about the same amount to lose too! Thank you for putting it out there. I love that you’ve said it out loud. I started at 112.3. I was mortified. And yet now I own it, so that I can acknowledge how far I’ve come. So be proud and shout out your loss, it’s trimly inspiring.